As an only child growing up at Butterworks Farm in Westfield, Christine Lazor spent lots of time alone. She'd play on the stone walls and in the tree lines at the edges of the fields. "I enjoyed being invisible," she said, "out of the way, unobtrusive. I think I felt like part of the bigger picture, part of nature, time and space." Back then, her parents, Jack and Anne Lazor — now 66 and 65 years old, respectively — worked long days milking cows and tending fields of organic grain. Many evenings, they made yogurt in the farm's modest production plant until well past suppertime. Christine, now 37, said she learned to make her own dinner — spaghetti and scrambled eggs — by the time she turned 8. "The business was everything," she said earlier this month, sitting at her cluttered kitchen table. "Family time was kind of incidental." By age 15, Christine was milking cows regularly — she liked spending time with the animals, she said. Still, she never imagined she might one day take over the farm. Two decades later, that's exactly what she and her husband, Collin Mahoney, 43, are doing. Christine realized that if she didn't take responsibility for her family's farm, someone else would. "I wanted to do it for this place," she said. "I have a real attachment to this spot." Today, Christine and Collin work as managers at Butterworks. They're about 10 years into a process that will eventually transition the farm from Jack and Anne to them. With estate and business planning, day-to-day operations, and family dynamics all part of the deal, the Lazors have discovered that passing the farm from one generation to the next ain't easy. And they're not alone. According to Don Buckloh of the American Farmland Trust, 90 percent of New England's older farmers have no one lined up to take over. Transfers — between family members or otherwise — involve many separate issues: animal husbandry, land stewardship, employee management and ethics, along with product development, branding and marketing. At the Intervale Center in Burlington, farm business specialist Sam Smith helps families and total strangers through the process. In many cases, he said, "the business model that worked for the exiting farmer isn't going to work for the next generation." For a transfer to work long-term, the operation must be profitable enough to weather unpredictable swings in agricultural markets. While many baby boomers could "get into a relatively cheap piece of property and struggle along for 50 years," Smith said, today's young farmers must excel to stay afloat. Almost one-third of New England's farmers will retire in the next decade, according to a multiyear study the American Farmland Trust and Land for Good released last year using the U.S. Department of Agriculture's 2012 agricultural census. In Vermont, farmers ages 65 and older own 28 percent of the state's farms. Together, they manage 363,600 acres of land; their combined ownership represents some $1.2 billion in real estate and infrastructure. Cases such as Butterworks' are rare: Just one in 10 aging farmers is working with a manager — like Christine or Collin — who is under the age of 45, the study showed. What's more, the trend isn't improving. Between 2002 and 2012, the number of farm operators ages 45 and younger fell from 19 to 11 percent. So, as Vermont's farm population — average age 55 — grows older, fewer young farmers are stepping in to replace them. Nearly all of the state's elder farmers will stop working in the next 20 years; most will do so in the next decade. At that point, their property will change hands in one way or another, whether it goes to family or to an unrelated farmer, or is parceled off for housing or commercial development — usually the most lucrative choice. 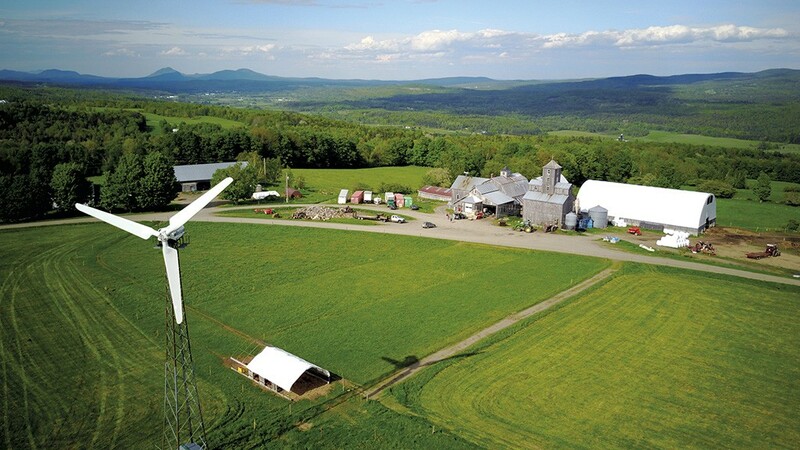 Despite its maturing demographics, Vermont is now home to more farms than ever before — 7,338 as of the 2012 agricultural census, up from 6,571 in 2002 and 5,436 in 1992. But many of the newer farms — which need only gross $1,000 per year to be counted in the census — are small, often just a few acres. And they're not all about Holsteins and hayfields and undulating rows of corn. Most incoming growers — the ones slinging veggies at farmers markets and running CSA programs — operate on small, hyper-local models. These have lower start-up costs and less overhead than the larger farms of years past. They're also more realistic for millennials and Gen Xers, who are more likely than their parents to struggle with personal expenses such as student debt and high housing costs. For all of these reasons, would-be agricultural entrepreneurs may be reluctant to take on large farms whose owners are looking to retire. The average Vermont dairy farm is 150 to 175 acres, according to Vermont Deputy Secretary of Agriculture Diane Bothfeld. "If you want to be a vegetable farmer, maybe you need 25 acres. So when this [dairy] farm comes up for sale, it's like, I don't need all that." 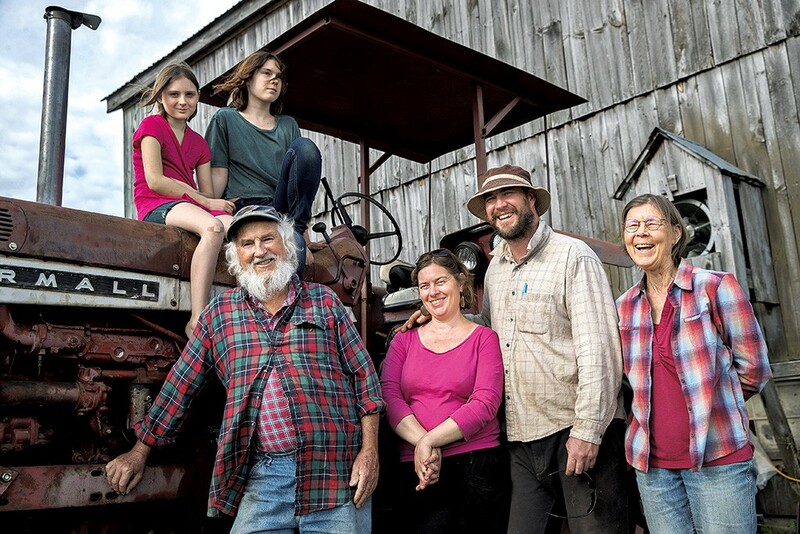 Bothfeld suggested that this shift from large to small, coupled with the baby boomers' march into retirement, could represent a sea change in Vermont agriculture. She likened it to the "last big one" — from merino sheep to dairy in the mid-19th century. Is it a crisis? Bothfeld doesn't think so. She seemed confident that Vermont will remain an agricultural place, and dairy will continue to be a big part of it. She just isn't sure how we'll get there from here. After graduating from Tufts University with a self-designed degree in the history of agriculture, young Massachusetts native Jack Lazor decamped to Vermont to live the good life in 1973. He worked at aging dairies in Caledonia County, where, as he recalled, "if you hadn't lived there for three generations and weren't of Scottish descent, you were really a second-class citizen." That summer, Jack watched as the family he worked for limped through an ugly and doomed transfer from father to son. "The son was taking over — kind of," Jack recalled, flipping a buttery grilled-cheese sandwich on a skillet in his kitchen last May. "It ended up failing, really." Jack talked about the inefficiencies of that farm, which was struggling to modernize following a flurry of midcentury regulations around dairying. He recalled the son as lazy and entitled; the father as stubborn and patriarchal, unable to see viewpoints not his own. "It was kind of interesting watching this place fall apart," Jack said. "I learned a lot about who I didn't want to be. That was really my introduction to Vermont agriculture." In December 1973, Jack returned to Massachusetts and met Anne while working at Old Sturbridge Village. She was finishing her bachelor's at the University of Wisconsin-Madison, where Jack briefly followed her. They moved back to Vermont in 1975 when Anne finished school; a year later, using $20,000 earmarked for her continued education, the couple bought 60 acres on a hilltop in Westfield. And a cow. "Everything was cheap back then," Jack said recently. "It really hadn't gotten crazy like it is now." Smitten with the idea of growing organic grain, Jack planted the fields with corn, barley and wheat. Anne learned to churn butter and made yogurt with the extra milk from the cow. Soon they added another cow and began selling fresh cheeses and other goods to friends and neighbors. Christine was born in July 1979. In October 1984, the state licensed the Lazors to produce and sell cultured dairy products. Over the next 20 years, their herd grew from three to six to 12 to 24 to 45. To support those cows — and Jack's passion for soil fertility and grain crops — they expanded their land base. In the late 1990s, they sold their land's development rights to the Vermont Land Trust, funding the purchase of two additional fields. Over the years, the farm swelled to 450 acres, much of it on prime bottomland flats in neighboring Troy, and the couple pioneered their own unique breed of organic farming and cold-climate grain production. They were among Vemont's first farmers to stake a business on producing artisan food on-site. When Jack wasn't doing field work — or mentoring interns, apprentices, local ag students and other striving young farmers — he traveled around the region, meeting buyers and delivering, selling and marketing the yogurt. While he was on the go, "Anne stayed home and did all the work," he said. By 2007, Butterworks was churning out 7,000 quarts per week of creamy, silky-smooth organic yogurt — at $6 per unit, that represents an annual retail value of more than $2 million. The company went from supplying co-ops and health food stores to regional grocery stores and Whole Foods Markets down the eastern seaboard. Jack likes to say they rode "the wave of yogurt." Then, sometime around 2008, he said, "We kind of passed our sweet spot." As the business swelled, Christine was never far away. Aside from a year at the Putney School and brief travels in the Pacific Northwest, she's lived her entire life within a few miles of the farm. She met Collin through a friend in late 1999, and, when the couple moved to an 1800s farmhouse on the Lazors' farm the following year, Anne taught him to care for the cows and steward their nutrition from soil to hayloft. By the time they married, on the farm in 2002, Collin and Christine had tacitly agreed they'd stay there for life, Christine said. Collin stopped doing concrete formwork off the farm and started working in the barn full time. In 2003, Christine gave birth to a daughter — Virginia Anne Mahoney — at age 24. Daughter Ursala followed in late 2007. Christine juggled childcare and pushing paper for Butterworks — processing orders, writing bank deposits, matching checks and invoices. Collin worked around the farm, filling in wherever needed and spending lots of time with the cows and Anne. In 2007, the family began to talk seriously about how and when the younger generation would take the reins. They rolled Butterworks into a new LLC — with Jack listed as the sole principal — and hired their first staff accountant. Since then, Jack and Anne have transferred about 75 percent of the land base into Christine's and Collin's names. When succession planning began, finances were looking sound after 30 years of steady growth. In 2007, the Lazors invested about $300,000 in a big addition on the barn to house the yogurt plant, along with a new boiler and other infrastructure improvements. Sales continued to tip up, but the expansion, a recession and a big shift in yogurt markets conspired to threaten the farm's financial stability. In 2008, the economy tanked. Consumers spent fewer dollars on products such as organic farm-made yogurt; some Butterworks customers migrated to big brands like Stonyfield Organic, which offered a similar product at a lower price point. Meanwhile, as the company adjusted to expansion-related expenses, the first little pots of Chobani Greek Yogurt found their way into American grocery stores. Since 2007, the thick, high-protein snack has gobbled up 54 percent of yogurt sales nationwide, according to market data — mostly at the expense of traditional yogurts like Butterworks'. Sales — particularly of nonfat yogurt — dropped. Butterworks lost a few big accounts, including a well-trafficked Whole Foods in New York City. When, in 2015, the Lazors had to replace a tired old yogurt cup-filling machine with a new one — for $200,000 — things went from bad to worse. For Jack and Anne, anxiety seeped in: How would Collin and Christine turn around a business that was, in effect, shrinking? Jack was desperate to right the ship before giving the kids the rudder. "I just wonder," he said in his kitchen a year ago, "if we're in the right place [for today's market] ... There's so much for people to choose from in the yogurt world." Plus, he added, "Is this really what [they] want to do? This whole value-added [business] thing: You do all this extra work so you can have a product you can put your name on. It's not for anyone who wants sanity or a life." Jack and Anne explored employee ownership; they hatched plans to pass the milking operation to Christine and Collin and turn the yogurt biz into a co-op. They vetted third parties, playing matchmaker with potential business partners for their daughter and son-in-law. "I think Jack was really holding out hope that some really idealistic young couple would come along and relieve us of this," Christine said. "They couldn't envision that we could do it, so they were trying to do it for us. They felt like they needed an influx of expertise and money to keep it from failing; like if there were more hands, their 'baby' would be safer." To make matters worse, Jack had been diagnosed with prostate cancer in 2010. A hospital stay in July 2013 revealed that his kidneys were failing. Now, he spends five hours, five days a week, hooked up to a dialysis machine in his living room. Though he's still more animated than many 65-year-old farmers, Jack's health problems and business stresses have sapped some of his energy and acuity. The specter of his own mortality has added more urgency to questions of succession — and more weight to the everyday toils of running a business. "He'll get bummed out about something," Christine said, "and be like, 'Why would you want to do this?'" But in reality, Collin said, "The transitions are kind of happening on their own." With Jack stuck inside for hours most days on dialysis, a procedure that Anne must administer, "They can't be here." Anne has stepped away from the barn chores and milking. While she's still there to consult as needed, she no longer makes day-to-day choices about the cows. Yet Collin — and barn and milk-quality manager Asa Manning — manage the herd mostly as she and Jack did. "We look at things basically the same way," Collin said. "My views on agriculture — give back what you take away — are really aligned with theirs." But, he added, step away from the fundamentals, "and that's where we disagree." Often, he said, agreeing on the minutiae of day-to-day cow husbandry — breeding practices, hoof trimming, veterinary care — is a challenge. Jack and Anne remain integral to big-picture operations and planning. "They definitely feel responsible for making the right choices," Christine said. But, she added, "the market is so competitive right now, almost anything you do can be a mistake." "It will be a mistake in some way or another," Collin added. "Nothing is ever the right thing completely." Christine and Collin both look young, but at times they seem wearied by a decade of high-stakes decisions and tricky family dynamics. But when asked what stresses her most about the farm, Christine didn't delve into market perils or family drama. "I want Butterworks to be a really great workplace," she said, concerned that long-term employees who manage dairy plant operations don't always get the credit and appreciation they deserve. "Sometimes, as a family member and as a team leader, I can't make that happen as much as I'd like," Christine said. "It's always this unattainable goal." On a sunny afternoon last May, a bluebird sky was broken by clouds so light they appeared to float away in wisps. Christine and Jack walked through an opening in the stone wall behind Jack and Anne's house. They descended the rocky dirt road to a verdant pasture exploding with spring's first flush of dandelions. There, 45 cows munched greedy mouthfuls of shin-high forage. "This is their first day on pasture this year," Christine said, making her way to a wire fence bisecting the field. She opened the gate. The cows gleefully pushed into the untouched pasture on the other side and plunged their heads into the grass. "This is the first year we're going 100 percent grass-fed," Jack said. As an organic dairy, Butterworks had always pastured its cows spring through fall, but the new, no-grain regimen was a big change. Christine said she had advocated for the switch after learning that grass-fed milk packs more beneficial fatty acids and other nutrients than other milks. She'd also seen how companies such as Organic Valley and Maple Hill Creamery had succeeded in marketing grass-fed products. "At the same time," she said, "[growing] grain was very costly, and it wasn't really a moneymaker." Everyone on the farm liked the environmental benefits associated with not tilling fields for grain crops. Still, going grass-fed would impact everything from summer fieldwork schedules to feed storage, milk supply and marketing. The elder Lazors stalled on the decision. But, as the fields turned green the following spring, Christine was adamant. "I kept saying it," she recalled: "'This is the moment! Let's go grass-fed! We have to do it now!'" The family went for it. Even with last summer's months-long drought, they've seen positive results. 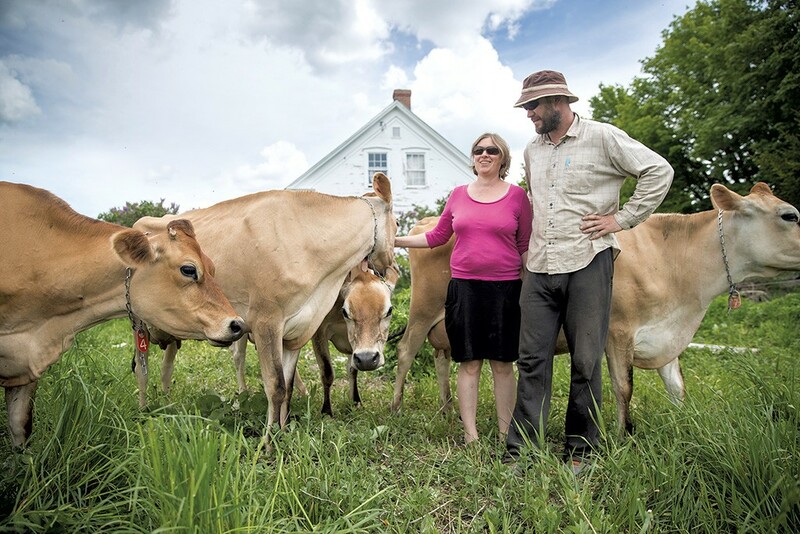 "The cows are just healthier," Christine said, "and they're much calmer without the grain." While everyone could see the benefits of going grass-fed, other ideas don't go over as well. There were plenty of opinions about a recent logo redesign. A few years back, Collin wanted to purchase a $7,000 hoof-trimming apparatus. The new equipment, he argued, would allow farm workers to trim the cows' feet instead of paying an outsider to do it. "There was a lot of opposition," he said, "but they let it happen." Often, he said, Jack and Anne are more flexible than they realize. Compromise and flexibility are critical to any farm transfer, said Buckloh of the American Farmland Trust. In today's changing economy, he added, that's especially true in cases where "the parents were successful farming for 40 years, but they don't realize that there's been a change in the agricultural economics." The Lazors realize that all too well: "When we were starting out, it was so small," Jack said, "so the consequences were so much smaller then." At the Intervale, Smith said making the switch from elder to younger often requires concessions from exiting farmers, such as taking less equity value out of the older farmer's land or letting the new farmer go in another direction. If Butterworks' team can't keep things exactly as they are now, Christine said, "we can do something else that's good." She pointed to developing new products — already an ongoing effort in the yogurt plant — and finding new ways to engage her customers and community. Despite recent drops in sales, she said, "I'm confident in the following that we do have." Several times a month, Christine visits retailers to hand out samples and do product demos. She's inspired when customers stop to talk, she said, or when a new customer tastes the yogurt for the first time and loves it. "I get a lot of hope out there," she said. "Just by handing out samples and talking to people about the way we farm. This isn't going to end. We're going to keep doing this and making it happen, because these people support us so much." "Seriously Seven Days" is a new video series that takes a lighthearted look inside each issue and behind the scenes at Vermont's Independent Voice. In this episode, host Bryan Parmelee describes a Vermont dairy farm in transition, tells the tale of a Burlington dream house that's been under construction for more than 40 years and offers a sneak peek into the 2018 gubernatorial race.